Today at 1pm PDT and 8pm GMT, join us live on your PC, smartphone or tablet as we link the sister cities of San Francisco and Cork, Ireland live via Cisco TelePresence for St. Patrick's Day! 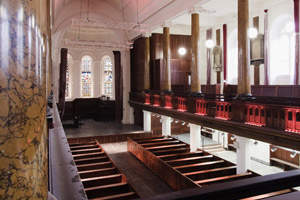 High definition video and spatial audio from the Pulses of Tradition festival of Irish dance, music and song in Cork will be streamed live at http://ustream.tv/ciscotv. From the other side of the pond, live footage and commentary from the San Francisco St. Patrick's Day Parade will be broadcast from City Hall in SF. Revelers attending the annual San Francisco St. Patrick's Day parade will be able to watch live performances from the Christchurch in Cork on their cellphones and 3G/4G-enabled tablets as the parade winds up in the Civic Center Plaza outside City Hall in San Francisco. 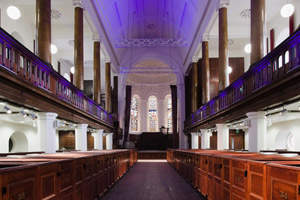 The performance features world class musicians and singers from acclaimed Irish traditional groups such as Buille, Liadan, North Cregg, and Nomos, along with breathtaking dancers, including students from the Irish World Academy of Music and Dance, at the University of Limerick. Meanwhile, attendees at the Triskel Arts Center at Christchurch in Cork will be able to see the San Francisco St. Paddy's Day parade as it winds its way from Market St and arrives at the Civic Center, where the Irish Flag was raised at City Hall last Friday. City Hall will be bathed in green light on Saturday to celebrate! Folks who prefer to enjoy a Murphy's or two at home on St. Patrick's Day can tune in via their web browser and watch the full experience of the two hour festival. Video from the event will be streamed live via the Cisco Ustream channel, so that anyone around the globe can watch the festivities! The Lord Mayor of Cork Terry Shannon will kick off the broadcast on Saturday, March 17, at 1 pm PT (8 pm local Cork time) with co-chair of the SF -- Cork Sister City Committee Jim Herlihy as our host in San Francisco. Next, attendees in SF will enjoy a live performance of traditional Irish dance, music and song by Pulses of Tradition direct from Cork until the performances conclude at 3 pm PT. Want a preview of what St. Patrick's Day in Cork looks like? Check it out! Download the Ustream app today for the best mobile viewing experience on Saturday if you plan to attend the Parade in San Francisco. If you are looking for a ticket to the live performance in Cork, there are still a limited number available here. We hope you can join us in celebrating a very special St. Patrick's Day! Sláinte! Just five years ago, Cisco introduced Cisco TelePresence ® technology, which delivered a video experience so intuitive, so lifelike and natural that it felt as if people were in the same room even when they were miles apart. But what started out as a way to save travel costs and optimize employee time at large companies has evolved into a way of accelerating time to market, expanding access to experts and transforming how companies do business. Today, Cisco is introducing new and expanded offerings -- from value-priced endpoints to a HD video software client to a hosted solution that are designed specifically to make the TelePresence experience available to everyone, everywhere, including small and medium-sized businesses. 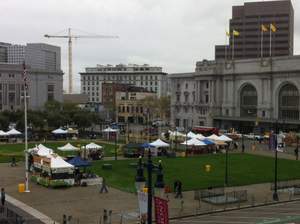 View of Civic Center in SF this morning from City Hall as the St. Patrick's Day Parade organisers prepare the Plaza for the after-parade festivities.